First Line: Moon and river. Poke Rafferty had been making his leisurely way around the world, writing a series of travel books for young and terminally bored males. First came Looking for Trouble in the Philippines, then Looking for Trouble in Indonesia, but when it was time to write Looking for Trouble in Thailand, he found the country had an unbreakable hold on him in the form of two women: beautiful former go-go dancer Rose, whom he wants to marry, and Miaow, a tiny young girl Poke rescued from the streets, whom he wants to adopt. Unfortunately he was once very lucky in finding someone, and that luck has come to haunt him. Poke reluctantly agrees to try to locate an Australian woman's missing uncle, and even more reluctantly takes on the assignment of locating a blackmailer. He needs the money to speed the adoption of Miaow. To top it all off, that tiny urchin insists that he take another street child under his wing-- a very scary young boy known as Superman. Things are about to become very, very complicated. Not only is Poke not a real investigator, he really doesn't understand the country in which he's living, and that is a volatile and dangerous combination. I could go on and on about characters that immediately latched on to my heart, a setting that I could taste and smell and feel, and a plot that flowed smoothly to its conclusion, but I won't. What struck me most forcibly in reading A Nail Through the Heart was a true feeling for the culture of the people of Thailand. I have long been a fan of the novels of John Burdett which are also set in Bangkok. Featuring Royal Thai detective Sonchai Jitpleecheep, they also are fascinating portraits of the Thai culture. In them, however, I will never be anything other than a farang-- an outsider, a foreigner, a crass American who will never truly understand the Thai people. Although keeping me at that remove is a good thing for maintaining necessary humility, I found Poke's sometimes bumbling attempts to understand a very different culture made me an ally who was more willing to open her mind and her heart. As Poke learned, so did I. Heart. Not only is heart in the title of this book, it is also on every page. 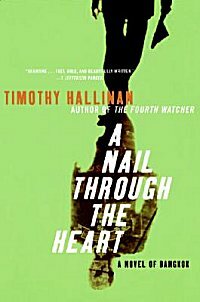 As each chapter flowed into the next, I felt that Hallinan wrote this with a great deal of heart, of emotion... of love. As a result Thailand became alive to me in a way that it never had before. Timothy Hallinan, you are jai dee. You've done it again. I know nothing about Thailand. I must read this book for its characters and setting. It's a funny thing. I don't read many men authors. Not sure why. Just don't connect that well. However, your heartfelt review of this book has me wantiig to pick it up, Cathy. We have some friends who live in Chiang Mai, Thailand and have for many years. I am very interested in Thai culture and think this would suit me quite well. OOO! An A+ one. I have put this book on my list. Thanks. Oh no, another writer I´ll have to try some time. But I just dragged nine books with me home from CrimeFest. Most of them were free, but why is it you never remember that free books also take up space? Wow! An A+! I have this as an eBook and you've encouraged me to push it up the list. Oh I'm so excited to see you rate this one so highly. I've got it, but haven't gotten around to reading it yet. Your review makes me see I need to move it up higher on the TBR list. Kay-- I think it would. I remember the time I read predominantly male authors, but that changed dramatically last year, and the trend continues. It sounds like a very interesting novel, I like the history behind the main character and how he ended up where he is. Kris-- You immediately get a feel for Poke Rafferty that way. It's a perfect set-up.